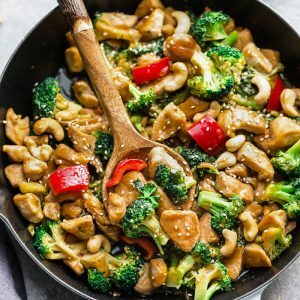 Teriyaki Chicken Stir-Fry is the perfect simple recipe for busy weeknights. Best of all, only 20 minutes to make with tender chicken, broccoli, bell peppers and a sweet and savory Asian inspired sauce. Season chicken with salt, black pepper and 1/2 teaspoon sesame oil. Set aside. Heat a large wok or skillet over medium-high heat. Add 1 1/4 tablespoons olive oil and saute chicken until cooked through, about 4-5 minutes. Transfer to a plate. Return pan to heat and add remaining 1 tablespoon olive oil. Add the garlic, ginger, broccoli and bell pepper. Cook until the vegetables are just crisp tender, about 2-3 minutes. Meanwhile, whisk together the Soy Vay® Veri Veri Teryiaki® sauce, sesame oil, lemon juice and chili garlic paste. Stir into pan along with the cooked chicken and toss to coat well. Adjust seasonings with salt and pepper as needed. Garnish with green onions and sesame seeds, if desired. Serve hot over cooked rice, quinoa, zucchini noodles or cauliflower rice.